This foil is easy to use on light-coloured or transparent (glass or plastic) backgrounds. Because the foil is transparent, it may change the colour of the sand when used on dark backgrounds, as then the background shows through. The foil has a strong adhesive layer, allowing you to rub over a sand decoration without the sand coming loose. Due to its strong adhesive layer, this foil isless suitable for being used with Sandy Art templates. This foil may be used for all Sandy Art techniques and materials. The adhesive layer of this foil is less strong than that of the transparent double-sided adhesive foil and is therefore also suitable for being used with the Sandy Art templates. The above types of foil are available in various sizes and shapes, as shown under the heading products in Sandy Art foil. You can sprinkle the sand in two ways: "high" or "low". The examples show the different effects of the two types of sprinkling. Take Sandy Art sand on the sand spoon. Hold it at a height of approx. 4 cm and drop the sand. This results in a large volume of sand having landed at one spot so that the colours are brighter and more uniform. When using this technique you should bear in mind that where you have dropped sand you cannot drop another colour on top of it. Always press the sand firmly with the brush and brush it clean. Take some Sandy Art sand on the special spoon, the Sandy Art® sand spoon. Hold it at a height of approx. 20 -30 cm (at the height of your nose) and hold the spoon horizontally. Sprinkle carefully, as if you are doing it with a shaking hand. The sand is scattered over the foil. Using this technique you can sprinkle various colours one on top of the other and get an attractive water-colour effect. The procedures for these three products are practically identical. Below it is described step by step with photographs for a card with a template. 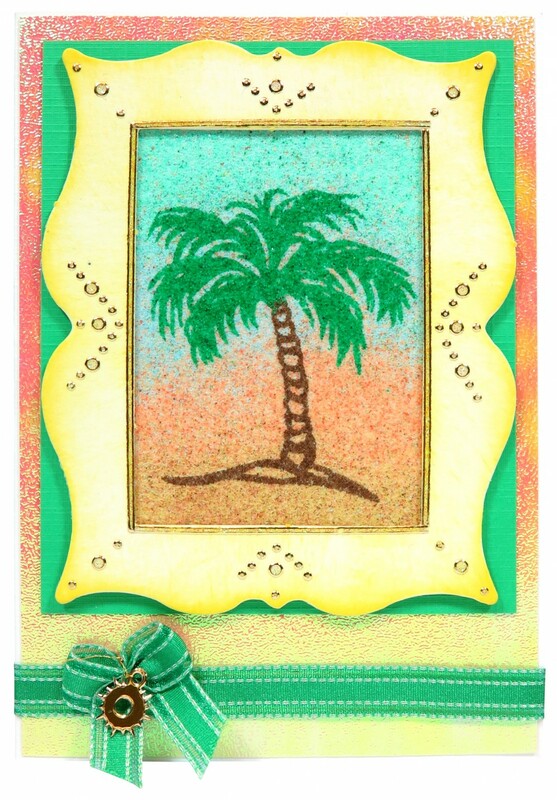 If you want to decorate something else, do not stick the foil on a background, but make the picture with the sand first. 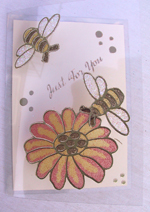 Sandy Art® sand, Sandy Art® template, Sandy Art® double-sided adhesive foil, white, Sandy Art® brush, Sandy Art® spoon, card. Step 1: Remove one protective layer from the foil, stick the template on the foil and press it firmly. Tip: Use the smooth side of the protective layer to press the template to prevent the adhesive layer from being damaged. Step 2: Sprinkle one colour of sand over the foil. Distribute it well over the whole surface with the brush. Press it firmly with the flat side of the brush and brush it clean carefully. Step 3: Remove the template as follows: bend the foild and press your fingers onto the back of the template. Repeat this until the template has largely come loose. Then take it from the foil carefully without bending the template. If the foil is not stuck on a card, pull the foil from the template carefully. Do not pull the template as then it may bend. 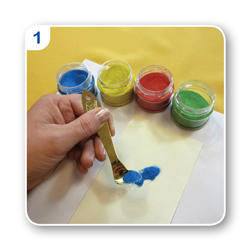 Step 4: Now sprinkle another colour of sand on the foil or color in the foil with multiple colors carefully using the Sandy Art® spoon. Do not brush of the sand until the complete foil is covered. Press it firmly and brush it clean with the Sandy Art brush. colours and by combining sprinkling high and low. This technique enables you to make an exclusive card in a nice way. You can also combine the cutting with attractive pictures of, for example, 3D sheets or napkins. General procedure: Copy the pattern you have chosen onto the protective layer of the foil. Cut in the lines with the Sandy Art knife. Note: cut through the protective layer only. If you press the knife too firmly, you will cut through the foil itself and that should not happen. If you want to make a card with this technique, you can stick the foil onto the background first. If not, try it out on a small piece of foil. When you have cut in all the lines, remove a cut-in piece of the protective layer and sprinkle sand in the colour you have chosen on this piece. Press firmly and brush clean. Complete the pattern in the same way. If you want to colour in more than one part with the same colour, remove all the relevant parts of the protective layer. Ensure that a part is well covered with sand before you continue with another colour. If the foil is not well covered, the colours will mix. Take a piece of double-sided adhesive foil. Remove the protective layer from the foil and put the contour sticker on it. smooth side up and put the sticker on it with the adhesive side up. Check that the sticker is level and then put the adhesive foil onto the sticker. This prevents a large sticker from becoming crumpled when it is stuck. Fill the whole sticker with sand in various colours using the handy sand spoon. Leave the sand until the whole sticker has been coloured in. It does not matter if you mess about some sand or it falls outside the lines. When you have filled all parts of the sticker, you press the sand firmly with the brush and shake the superfluous sand off the foil. Cut off all the superfluous foil and the result is a gorgeous sticker. If some sand has landed in the wrong places, you can correct this by scraping off the sand with the liner and filling this piece with sand of the right colour. Remove the protective layer and put the sticker on a card, a transparent sheet or another object. If you have used transparent double-sided adhesive foil and you put the sticker on a sheet, the effect is still transparent. 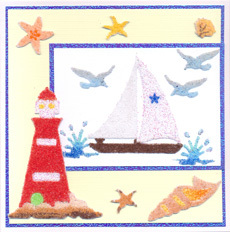 Sandy Art® double-sided adhesive pictures are pre-cut shapes with a gluelayer that may very well be used for making your own decorations on cards or objects. One design sheet enables you to make multiple combinations. - Remove the protective layer from the sheet with double-sided adhesive pictures. 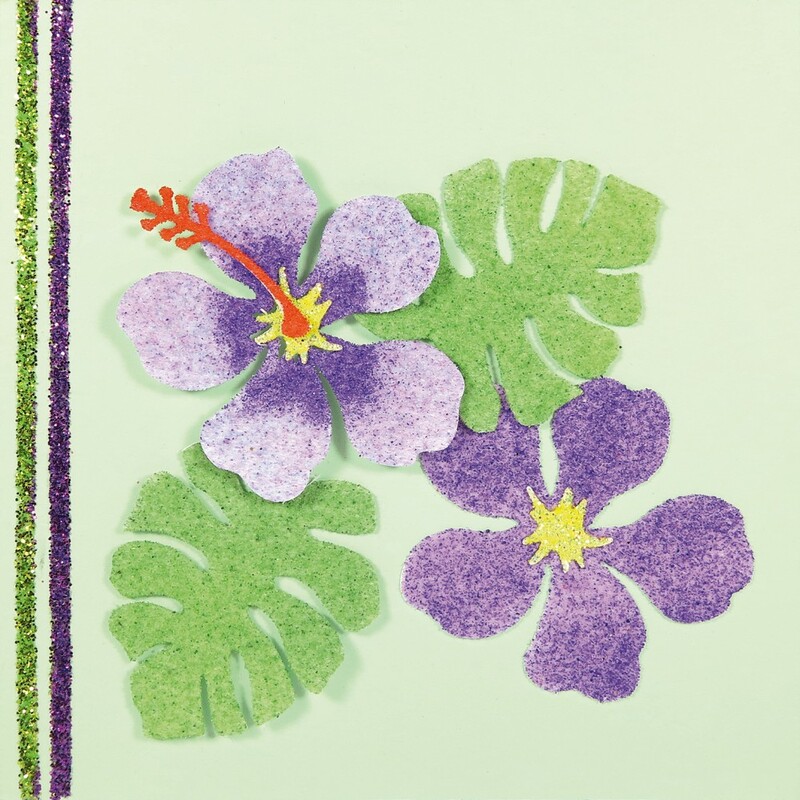 - Choose an adhesive picture and remove it carefully from the sheet using a hobby knife or tweezers and put it on the card or another object. - Press it down with the spoon or knive and sprinkle sand or brilliant sand on it. Other materials such as glitter or scrapito foil can also be used. - As the double-sided adhesive pictures are transparent, the background onto which the adhesive picture is stuck may affect the colour of the brilliant sand. For a bright colour, stick the adhesive pictures onto a white background. - Because the pictures are only mildly adhesive, press them firmly onto the card before sprinkling brilliant sand. Press the pictures using the spoon or tweezers to prevent the layer of glue being diminished because the glue sticks to your fingers. Working with Sticky Stickers is almost alike to working with double sided adhesive pictures. There is just one differnce. Sticky stickers exist from more different parts that you stick into each other or close to each other to obtain multiple colours. This makes it very easy to create a colourful design. Tip: Always make sure that you cover the part you are working on completely with sand before you proceed with another part and colour. Otherwise sand grains of the following colour will stick inbetween. 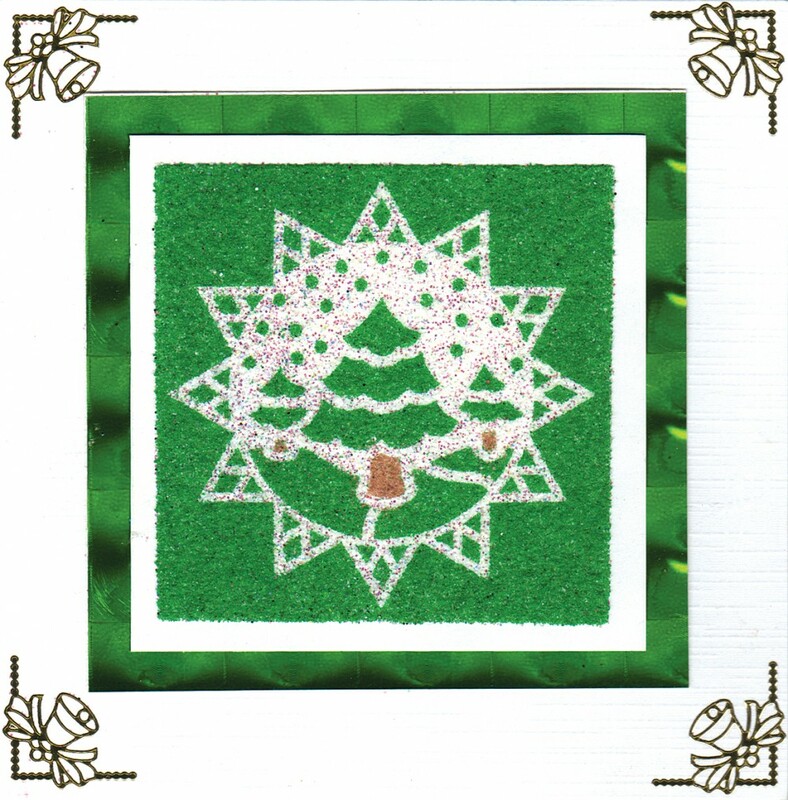 Sticky Stickers are packed in with one piece and available in Everyday and Christmas designs. The Sandy Art sand spoon is also suitable for left handed people. Turn the spoon inside to your wrist as shown on the picture. Just as easy to use as for right handed people.